Hi hi! 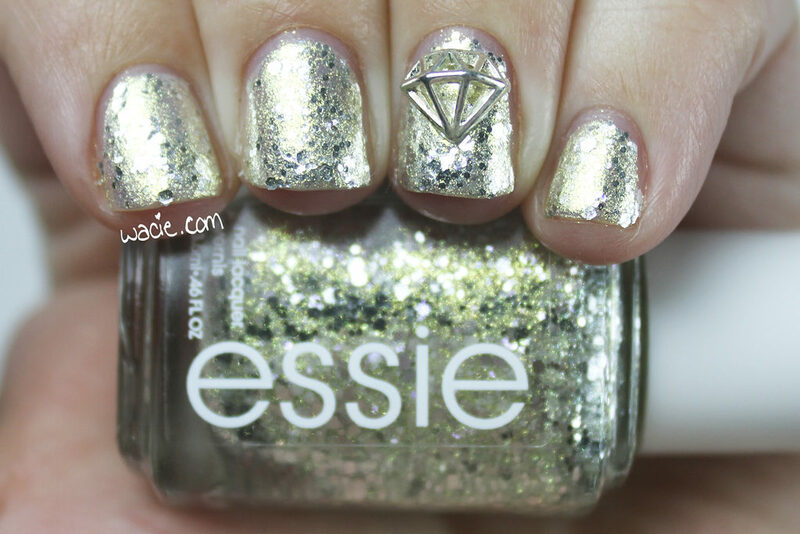 It’s Manicure Monday! Today’s look is one I kept simple, but it’s still over the top. 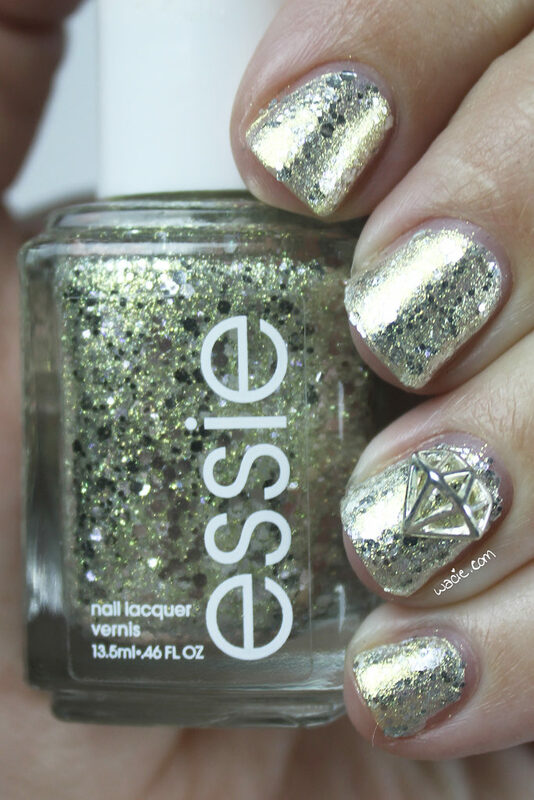 I used Essie’s Hors d’Oeuvres and a diamond charm from Daily Charme. It’s kind of insane. Hors d’Oeuvres is a challenge to photograph. 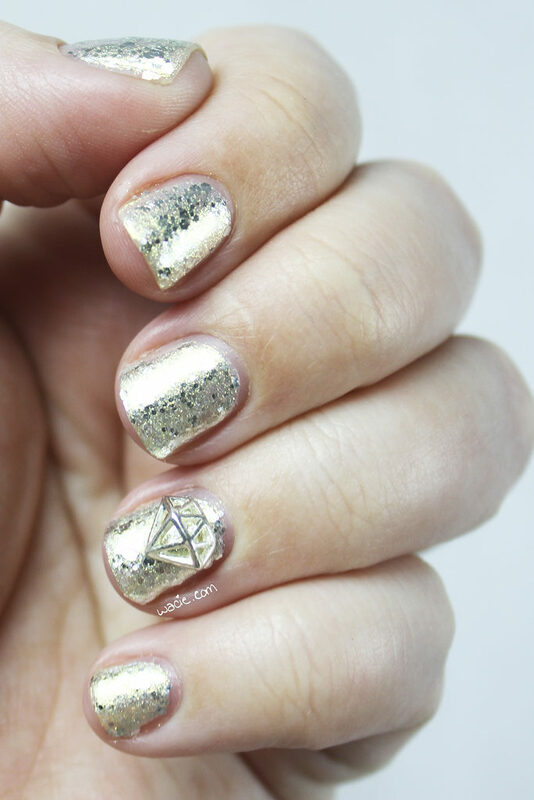 There’s so much shiny; the strong gold shimmer and embedded silver hex mix means a lot of light bounces off it and makes it hard for the camera to focus or get a good white balance. (I shoot on auto, sue me.) It’s also very reflective, which is a cool finish. I’m really enjoying it. 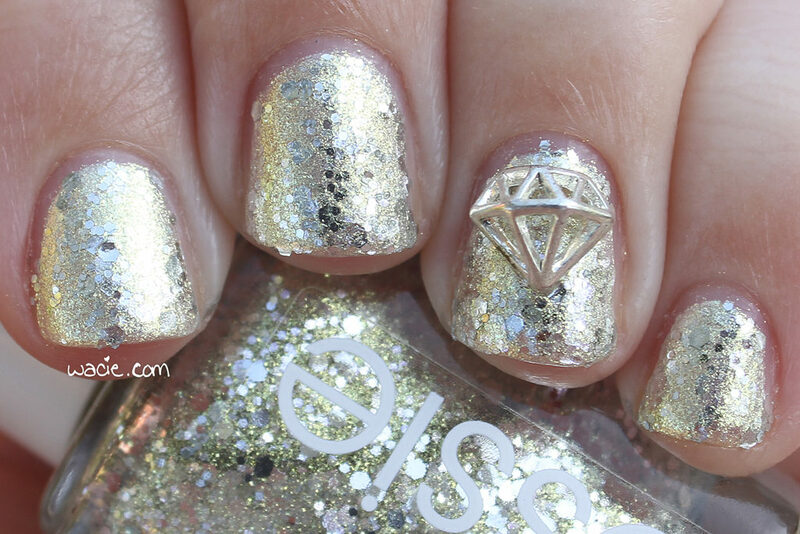 I ran out of super glue, so I decided to see if Seche Vive was enough to hold the diamonds on. It did, for a while, until one mysteriously disappeared. I still have yet to find it. I pulled the other one off to risk losing it and put on a second coat of Vive. 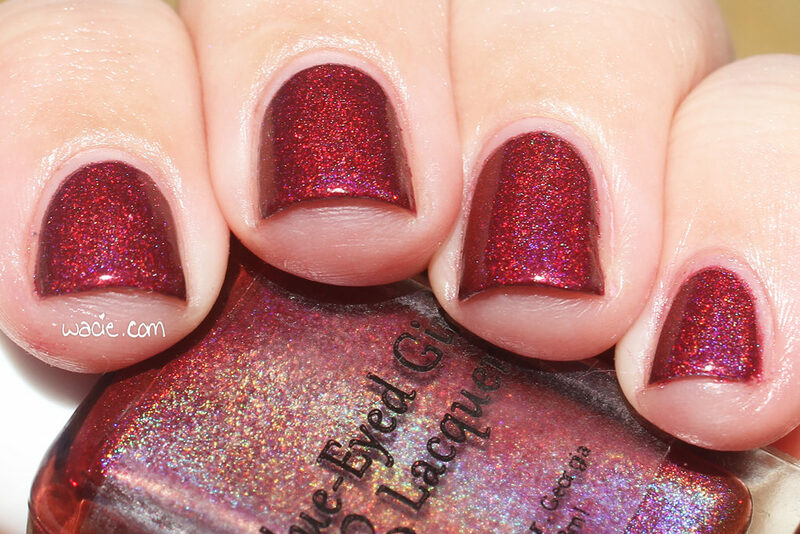 Speaking of which, have you guys tried Seche Vive? I was skeptical, since I’ve never used any of these gel-effect polishes or top coats before, but I really like how this one feels. I used multiple coats and haven’t noticed any of the bad effects from multiple coats of Seche Vite, so yeah. It’s too early to tell yet, but I might be a convert. The sunlight is probably where Hors d’Oeuvres looks its best. You can definitely see how reflective it is in these photos; that glare is out of control. This set of photos were taken in direct sunlight outdoors. This one is actually in the shade. 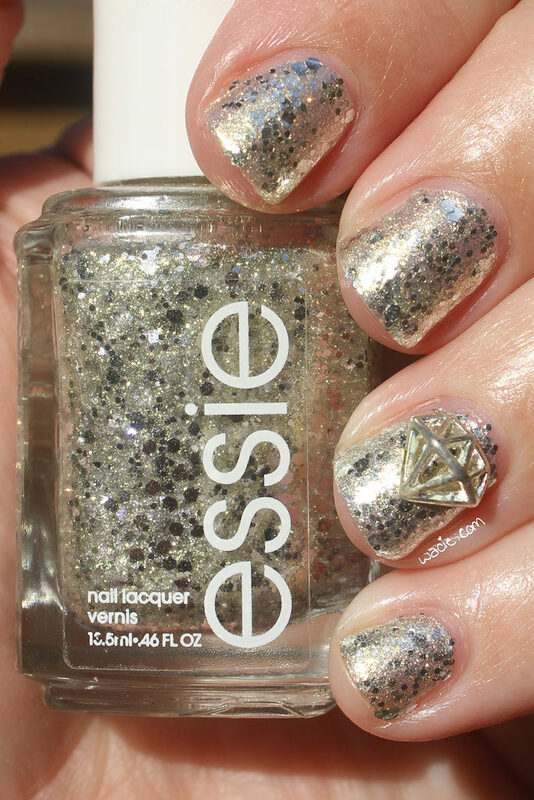 Hors d’Oeuvres and other Essie polishes are sold in stores. 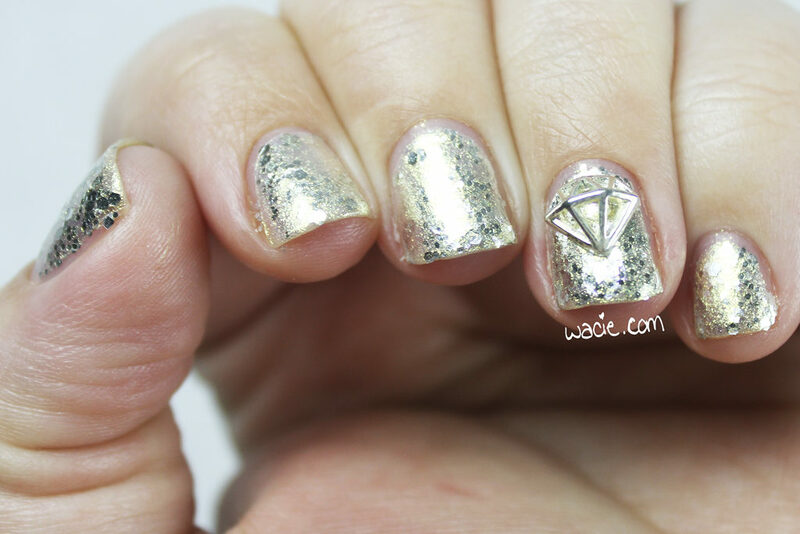 The diamond charm is from Daily Charme. Hello! Tonight’s swatch was delayed due to Super Bowl shenanigans. 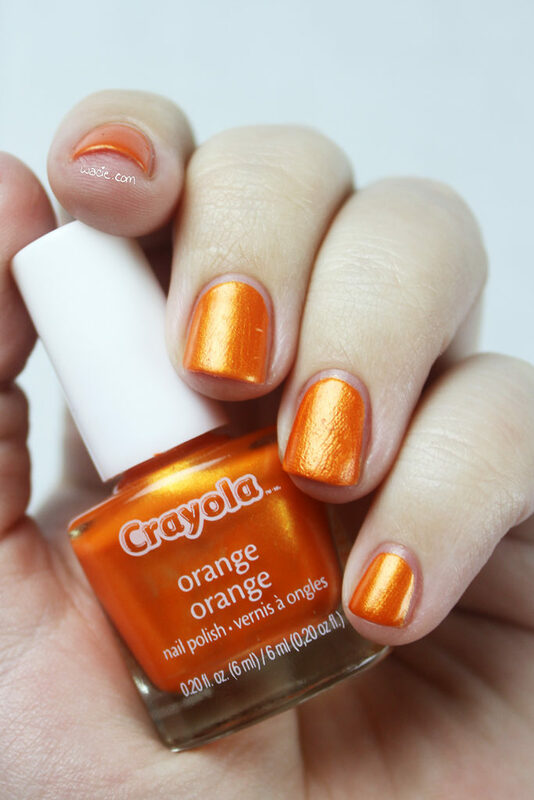 This week I’m bringing you a scented polish from a fruit rainbow themed Crayola collection. I picked this up a few years ago from a Rite-Aid while I was travelling in Philadelphia. 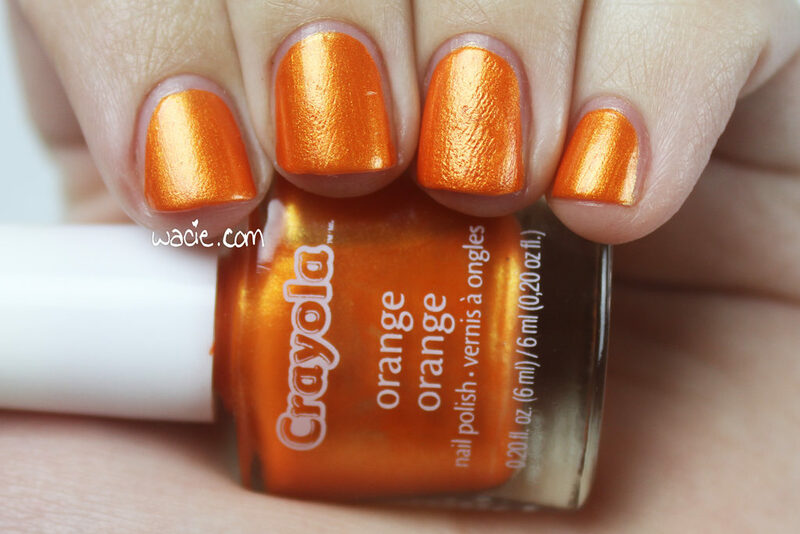 This is Orange; I’m wearing three coats without top coat. 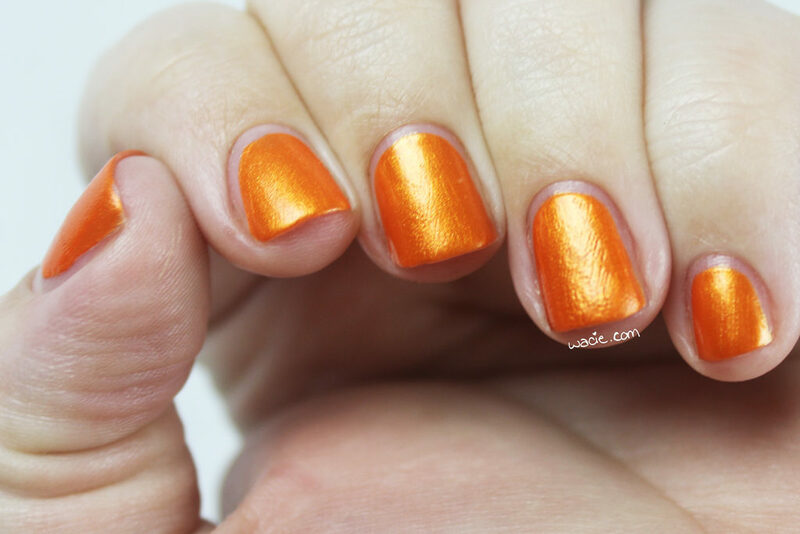 Orange is an orange polish with gold shimmer that is also scented with orange. It smells like orange soda. The scent didn’t last long, of course, not past a few hand washes. Application was good; the product consistency was good and was easy to use. However, it took a pretty long time to dry. I nicked one and brushed over it, and nicked it again about five minutes later. A few hours after application, when these photos were taken, they were still soft enough to be imprinted with fabric textures. 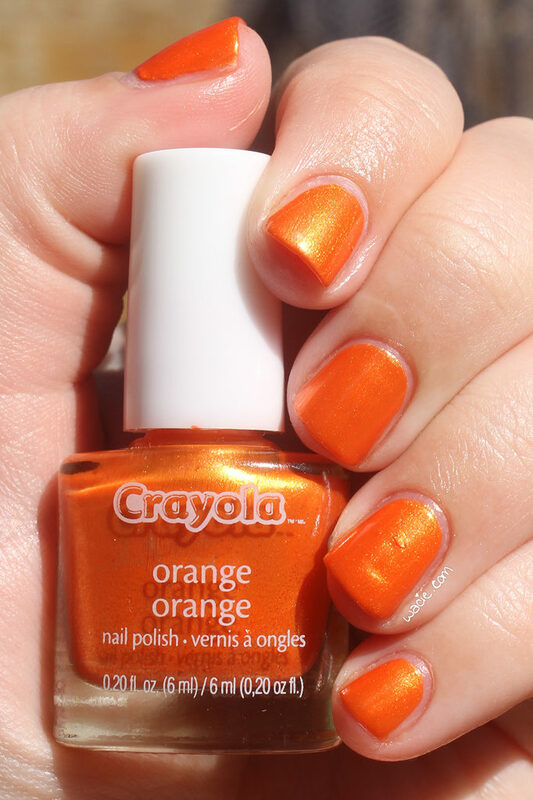 Even though I wish I’d not cared about the scent and used top coat, I rather like this polish. 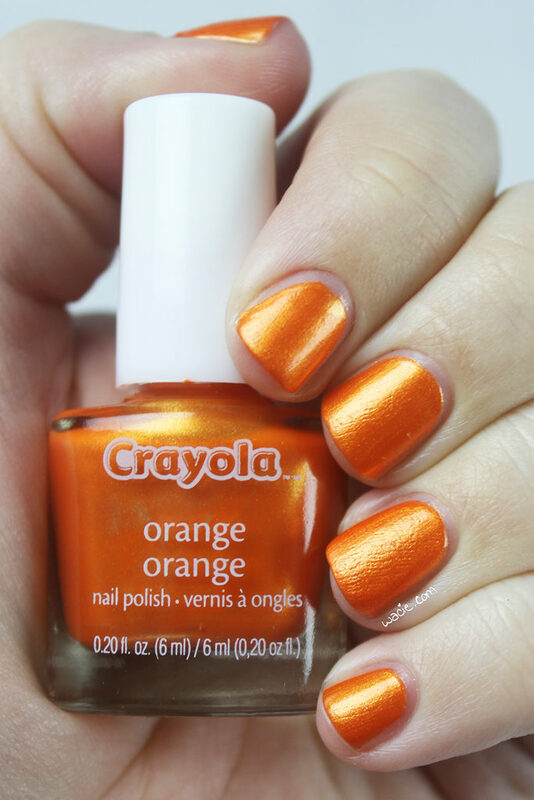 This particular orange reminds me of one I wore as a teen. 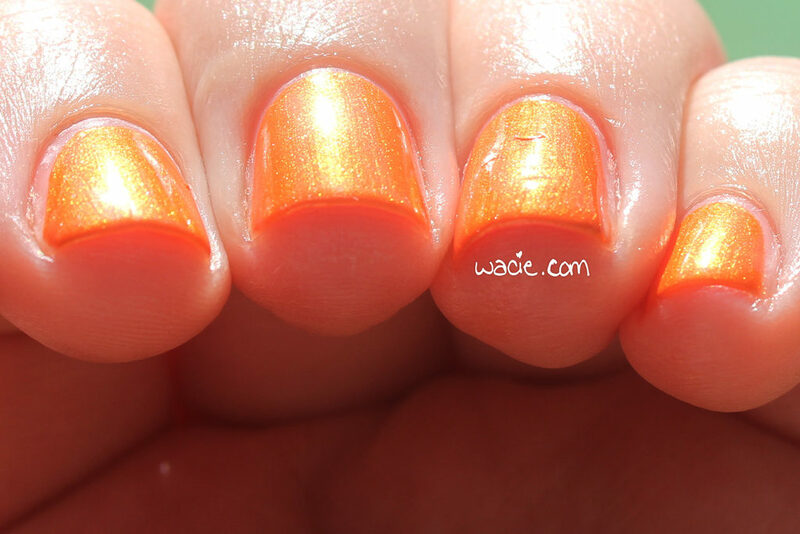 The color is bright, the shimmer is strong, and the scent is just a fun bonus. 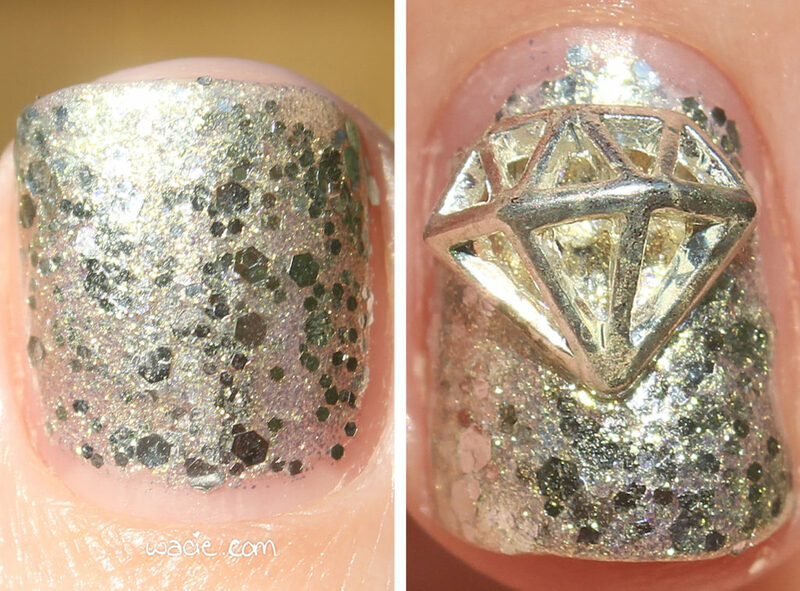 I’m really disappointed that it got imprinted, but that’ll teach me to skip the quick-dry top coat again. 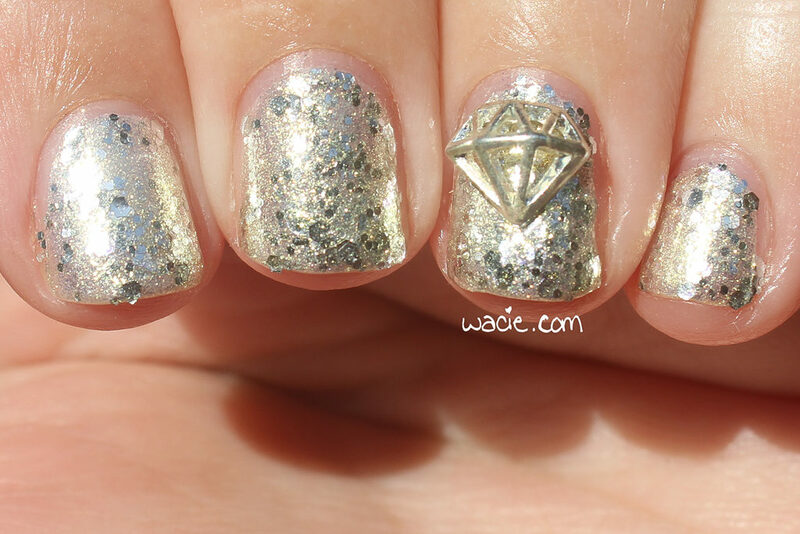 In the sun, the shimmer is crazy. I love how strong it is! 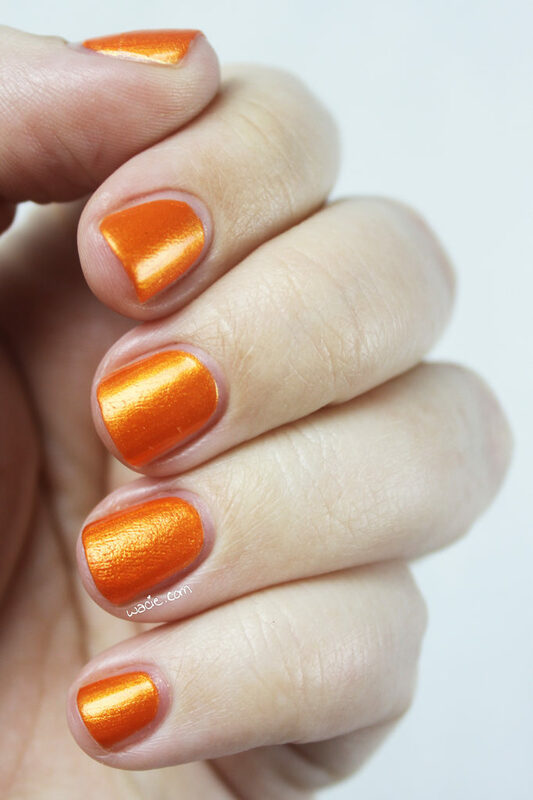 It’s an unexpected treat for a polish that isn’t intended to do more than smell. These photos were taken in direct sunlight outdoors. I bought this scented Crayola set at Rite-Aid, but you can probably find them anywhere; for instance, a quick search indicates they’re available on walmart.com. Hello, reader! I’m excited about today’s swatch. 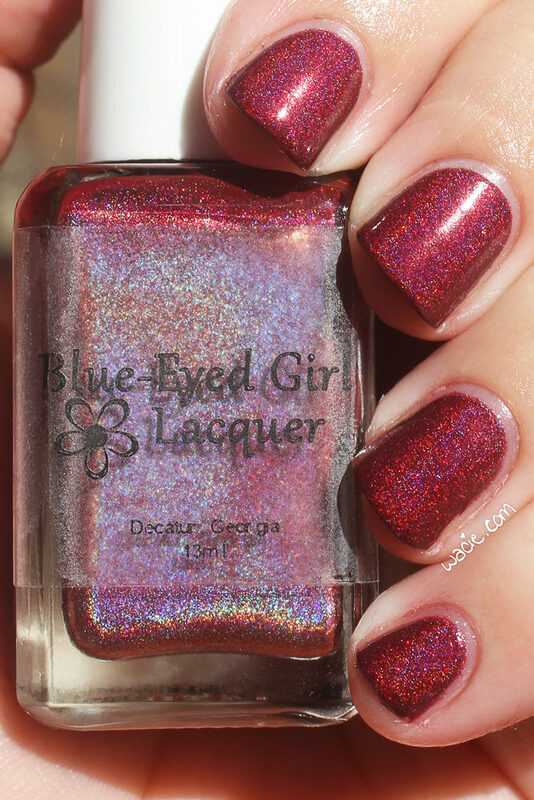 We have Blue-Eyed Girl Lacquer‘s Crooked Hearts behind us, and in the next few weeks, we’ll see some special edition polishes, some prototypes, and some Sirens from 2015. I’m so late to the party on these, but I can’t wait to get there. 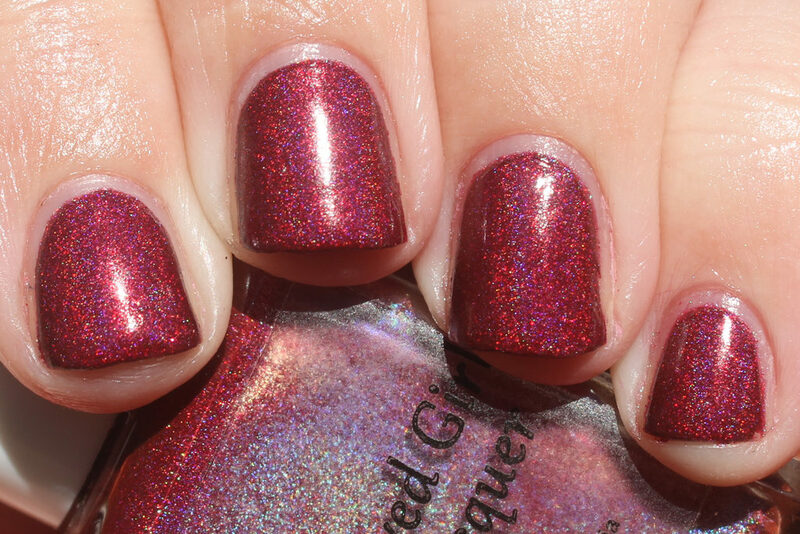 This polish, Cuts in My Heart, is the first of these; it was an Addicted to Holos box-exclusive. 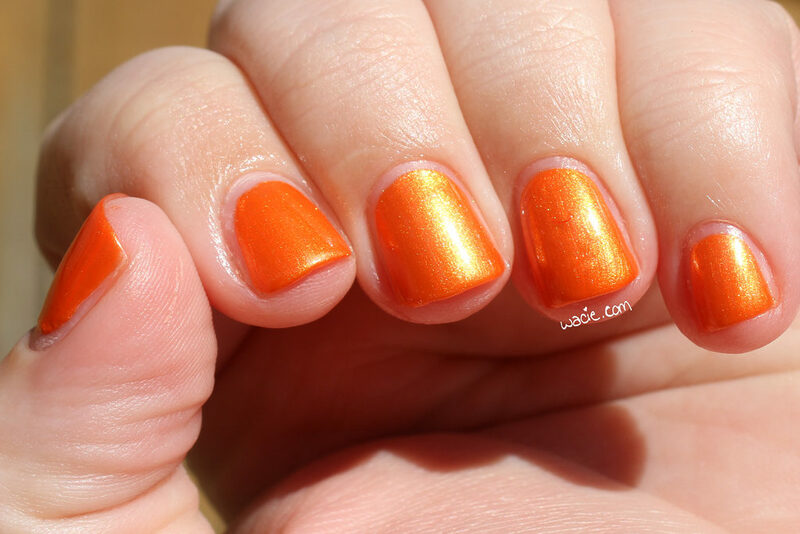 I’m wearing three coats with one coat of Dream Polish‘s Gem Glam top coat in the Melon Baller scent. All photos were taken in direct sunlight outdoors. There’s a wee bit of color settling on the bottom. This didn’t affect the color quality at all. 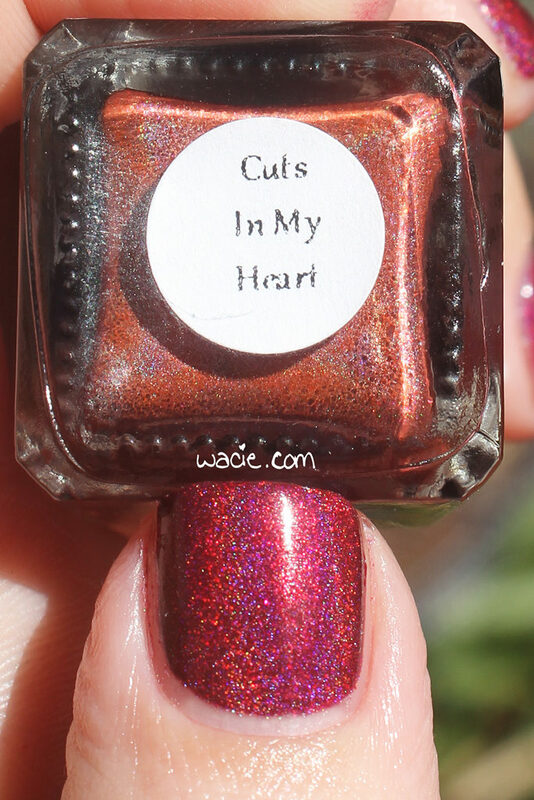 Cuts in My Heart is a deep red holo with red shimmers. 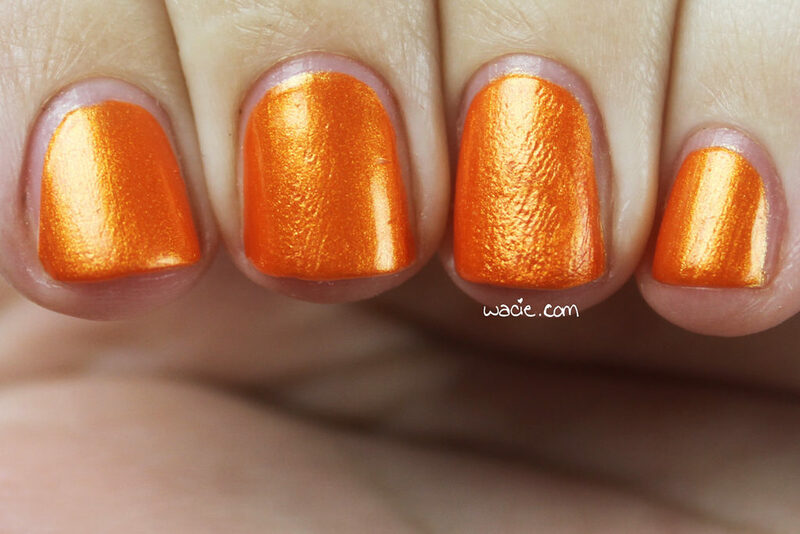 Application is good; would you believe this polish is a one coater? Depending on your application style, it totally could be. I actually did have an opaque first coat, but I added more just because I like the thickness. The product consistency is very good; it’s thick but doesn’t need thinning, because it’s still easy to use. 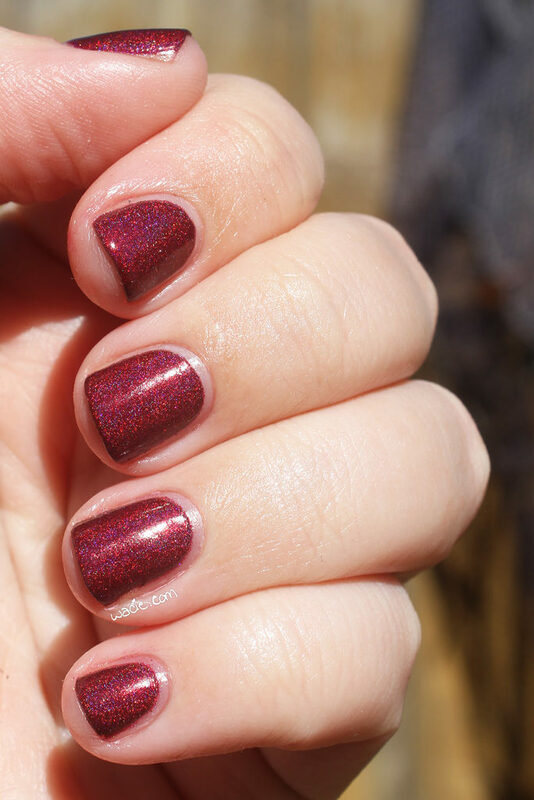 The polish dries quicky and with a satiny finish; top coat is necessary for shine. So, I love this. 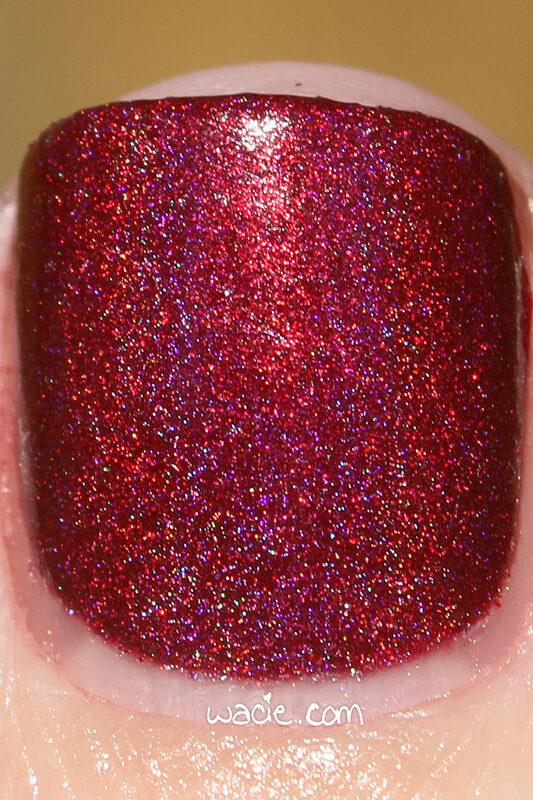 Red holos are already amazing, so of course I like it. 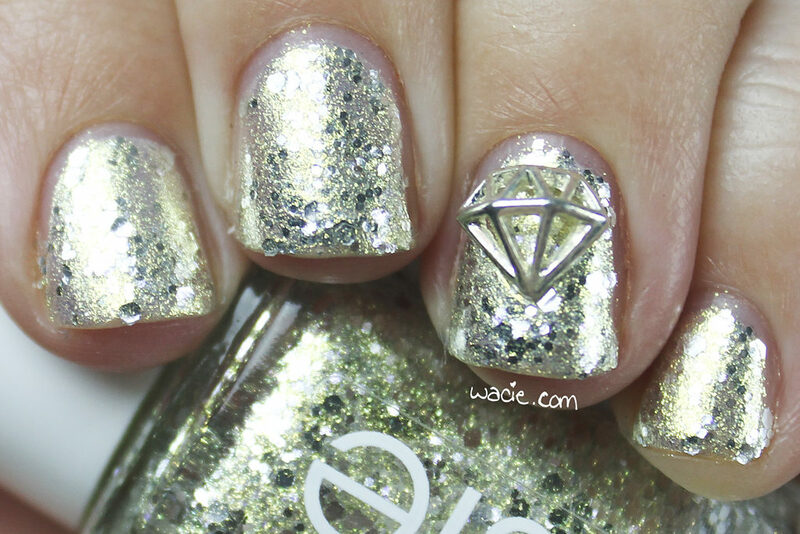 One thing I notice about this one is that I can actually see the shimmers in it. 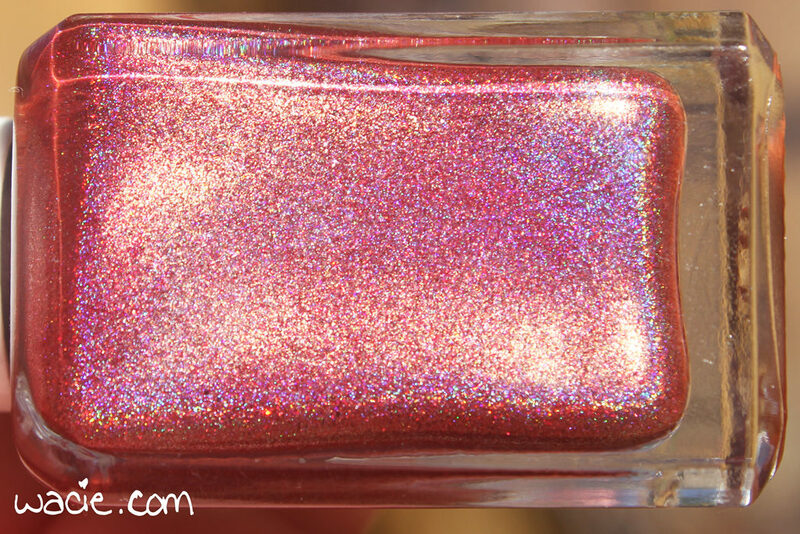 With a lot of the BEGL holos I’ve worn, the shimmers either get covered up by the color, or they blend into the color so well they’re undetectable. 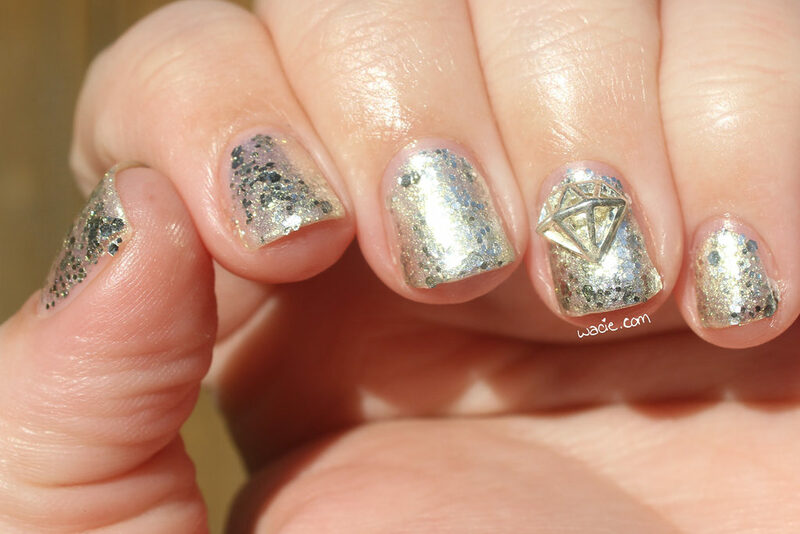 In this polish, I can really see them. 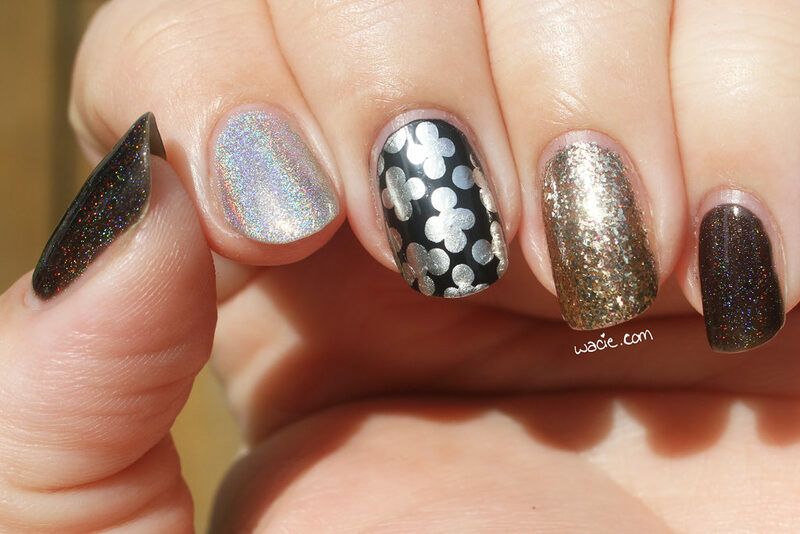 They’re the same color as the polish, but they also stand out. I quite like it. Cuts in My Heart, as I mentioned, was a box-exclusive and is since sold out. 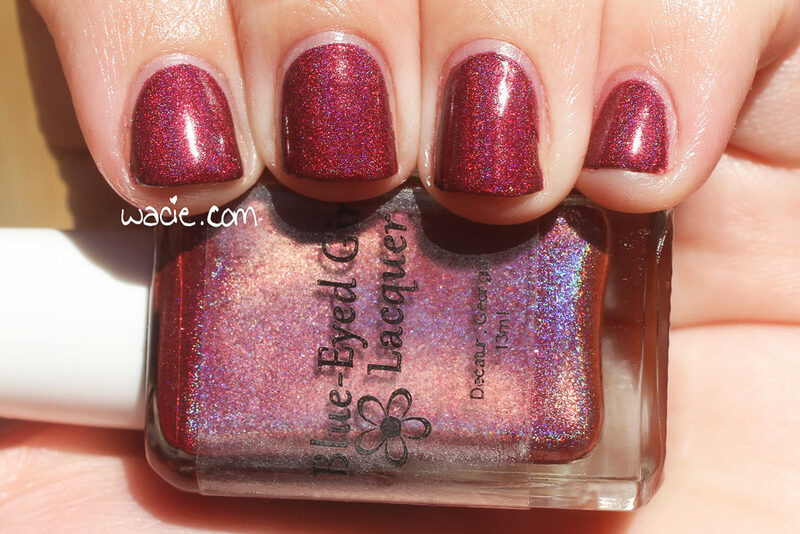 Other Blue-Eyed Girl Lacquer polishes are available in their online shop.